Scott Mulcahey loves wood. 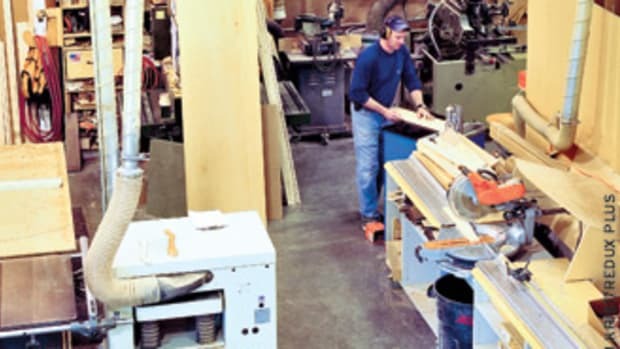 He can&apos;t bring himself to throw out the scraps of wenge, ash, sapele, purpleheart, black walnut, cherry and you-name-the-species he&apos;s collected from working custom millwork for more than 20 years. Even on vacation or walking the beach near his home, he finds driftwood and drags it back home, employing the help of anyone with him. Ten years ago, Mulcahey went to Jackman, Maine on vacation. Even then, he couldn&apos;t leave the woodworker behind. "There was a beach full of beautiful driftwood," he recalls. "I had to convince my friends to carry it back." 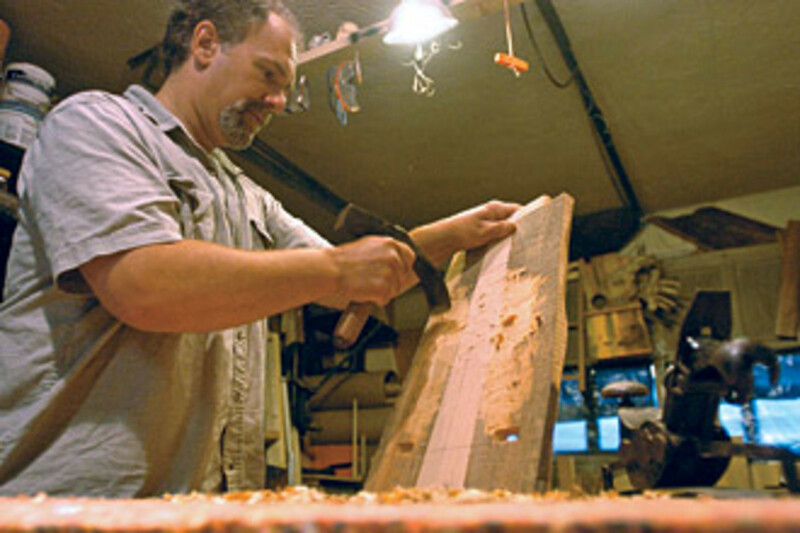 Mulcahey, slightly gray through his hair and goatee, has spent his career as a craftsman at top millwork shops. 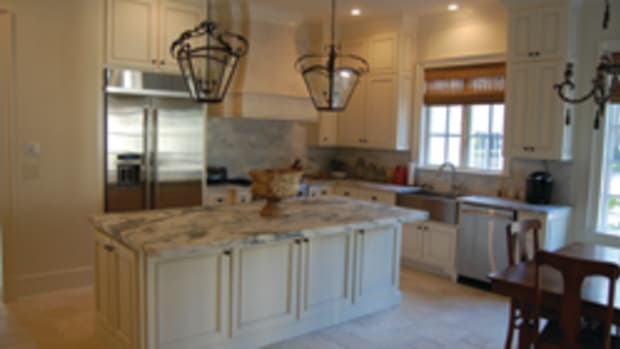 He&apos;s built custom kitchen cabinets, office furniture and cabinetry. He even had his own line of children&apos;s furniture, which he sold on the craft-show circuit for a few years. But nothing quite satisfied his imagination. Building custom cabinets, as technically challenging as it can be even when using combinations of exotic and domestic woods, eventually boils down to "building boxes." Even the children&apos;s furniture line eventually bored him. "You come up with a good design and then, after you&apos;ve made it four or five times, it just becomes production," says Mulcahey. So Mulcahey has stacks of wood. Bits and pieces. Beautifully figured domestic woods. Rare exotics. Gloriously bashed driftwoods. Too small to make sizeable furniture. Too beautiful to throw away. Mulcahey also has a career&apos;s worth of woodworking expertise. A master of both hand and power tools, production and custom work, finishing techniques and joinery, a practical marketing approach, and a sense of how design and technique affect price point and profit. All waiting to be dovetailed to his imagination. Quotable: "Nature is the best designer. I just reconfigure it to make a piece. I&apos;m secondary to nature." And finally, Mulcahey thinks he&apos;s found the vehicle he&apos;s been looking for: The chair. Small enough to use his scraps. Individual enough to satisfy his thirst for design and personal statement. No sets of Windsor&apos;s these. Each chair flows with the boards and scraps that create it. "I got into making the chairs because I had all these small pieces of wood from 20 years of jobs. It was all cracked and old," says Mulcahey. "There wasn&apos;t enough of any one species to make even a dining-room table. So I tried to think of something that would be small, but still be significant." So pull up a chair and relax. There&apos;s the child&apos;s stool of recycled pine, with the half moon cut out in the flat back. How about the one made of white pine driftwood? Mulcahey salvaged the wood from the beach at Lynch Park, in his seaside hometown of Beverly, Mass. 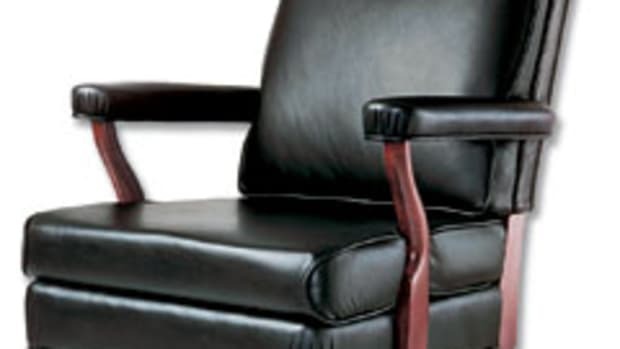 The chair&apos;s jagged top stabs the air. The green paint rubbed into its deepest crevices accents the natural wood and deep grain opened by who-knows-how-many years at sea. Or how about the sumptuous elegance of a chair made of mixed exotic woods and contrasting light apple wood? The back angles slightly away from the seat and holds a triangle of apple wood about 6" wide across its top. A series of natural knotholes work their way up the right side, a reminder of the wood&apos;s natural origins and a contrast to the fine, smooth finish on the rest of the chair. The apple&apos;s triangle point sticks straight down into the chair, wedged between the rich red-brown sapele that forms most of the chair back. Strips of chocolate-brown wenge run up apple wood&apos;s edges, setting the light apple off from the darker sapele. The wax and oil finish allows the piece to glow in the wood&apos;s natural beauty â€” Mulcahey now uses two coats of post-catalyzed varnish, which he says is much faster and still gives the same natural effect. The chairs â€” ranging from sophisticated sculptural pieces to children&apos;s whimsy to the rustic chairs of recycled and salvaged wood â€” reflect the combination of Mulcahey&apos;s technical expertise and his imagination. Mulcahey combines a master&apos;s craftsmanship â€” he hews his chair seats by hand with an adz and uses traditional mortise-and-tenon joinery â€” and a deceptively simple design sense. The most sophisticated designs present both unity and visual complexity that consistently pull the eye to the chair. Just as complex as the wood combinations in the sapele chair is the geometric design â€” a theme of interlocking triangles. The chair back has the apple triangle, inverted, with its point driving down into two triangles of sapele, which point up, away from the seat. The apple triangle joins the two counter-pointing triangles to give the back a full unity. The seat, too, forms a modified triangle, or a trapezoid. The front edge curves gently out from the ends to the center â€” the only curve in the design â€” and softens the presentation. The sides angle to a narrower back edge, which joins with the chair back via a through tenon at perhaps a 100-degree angle. The backward tilt provides enough comfort to make the chair usable and more than a mere sculptural curiosity. Mulcahey designs the chairs for use and believes that will help their market appeal. He&apos;s going slowly by introducing them to the studio-furniture market. He&apos;s working with a marketing company specializing in the Long Island/Hampton market and figures he&apos;ll be ready to expand there by summer. "I&apos;ve looked at the competition," says Mulcahey. He sees his chairs as fitting into a new design and price niche. "It&apos;s not really studio furniture. The closest thing I can compare it to is stick furniture, but it&apos;s not really that, either." For now, he&apos;s working with a local gallery. "I&apos;m in this for the long haul," says Mulcahey. "The next step is figuring out a way to market and sell them." At the Celtic Corners Gallery on Cabot Street in Beverly, owner Elaine Barry has carried the chairs for about a year. The chairs retail for between $120 and $450 and Barry has sold about 20. For the right client, the chairs make that significant connection Mulcahey envisions. Technique vital to finished product Scott Mulcahey uses a variety of techniques to make his one-of-a-kind chairs and bring them in at a top price of about $650. 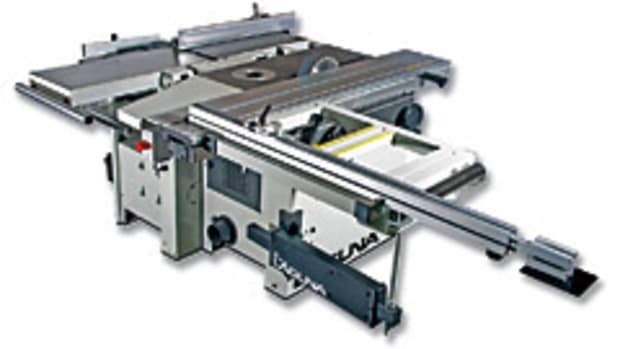 As much as he loves wood and woodworking, he also applies a hard edge to his work. "I use whatever I need to get the job done," says Mulcahey. He applies that approach across his entire construction process â€” choosing design, joinery and finish with an eye to construction time and final price point: â€¢ Mulcahey primarily uses two coats of post-catalyzed varnish on the chairs, applying the varnish before using any paints for additional color. "I have more control over penetration. I can apply the color and wipe it right off where I don&apos;t want it." Mulcahey said he&apos;d like to use multiple coats of tung oil and wax. But the process is simply too labor intensive. "It would put the price out of reach," says Mulcahey. "The varnish gives the same effect." â€¢ Because Mulcahey uses a variety of woods, uniform moisture content is vital before he starts. 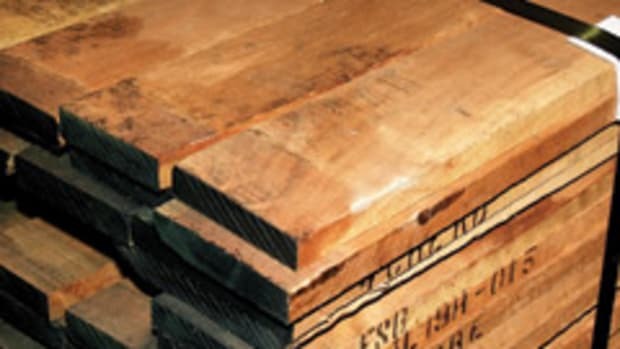 He makes sure his wood is at between 6 and 7 percent moisture content before he starts. The only exception: the found wood and driftwood pieces. "I don&apos;t care if those pieces open up. It&apos;s part of what they are." â€¢ Mulcahey relies on two joinery techniques for his chairs, one traditional, the other modern. The traditional through tenon adds vertical strength to his chairs â€” they can support up to 600 lbs. 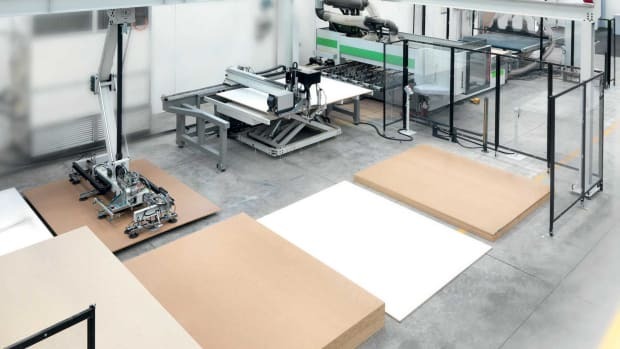 At the same time, they save time and money because they eliminate stretchers that would add an entirely new level of construction time and design elements to his clean style. 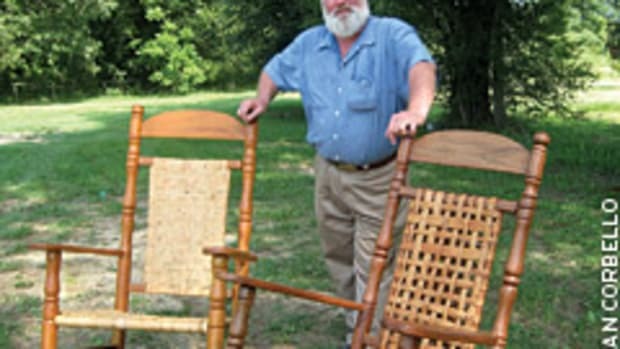 On the modern side, Mulcahey uses biscuit joints and epoxy to join the variety of scrap boards he uses to create both the chair seats and backs. Two tricks here: First, Mulcahey allows the wafer to absorb ambient moisture, so they are swollen and fit into the slot tightly to start. Second, Mulcahey makes sure he joints his scrap boards to a perfect dry fit. He&apos;ll use a jointer, hand plane or even an edge sander to get the fit he wants. "The fit has to be right," he says. "People come in and see them and if they like one, they have to have it," says Barry. "It can be the color or the wood. One woman bought a blue one for her bathroom because the color was right. I had two driftwood chairs that had all tangled roots at the top. I called them my Harry Potter chairs. A landscaper came in and saw them and bought them both." For Kelly Krajewski, the orange color and the look of her chair convinced her to buy. "I really like the rustic look," says Krajewski as she puts the chair into her SUV. "And I like how each one is individual. The furniture in my house tends to be unique and eclectic, and this just fits in." It&apos;s that one-of-a-kind combination of natural wood grains, the board&apos;s own history of use and abuse, woodworking skill and human creation that Mulcahey hopes will draw the market to his chairs. In designing each chair, Mulcahey starts with the back. Once he has that down, the seat and legs follow. His more sophisticated pieces may have legs with a sleek, gentle curve. His rustic pieces may have full, thick wood chunks for legs. Especially in his rustic pieces, Mulcahey exploits empty knotholes, rusty nail holes and broken edges to add texture and drama to the work. 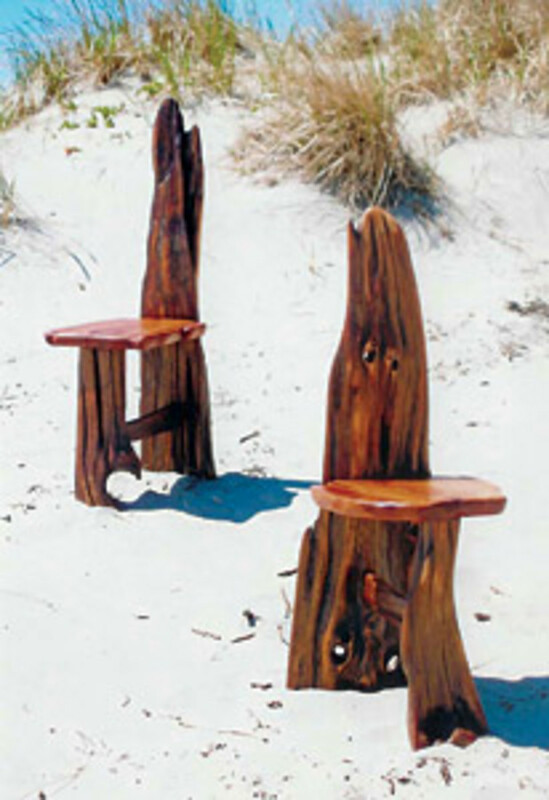 Mulcahey uses a combination of hand tools, mallet and chisel, an adz and hand planes and modern tools such as a band saw to create his chairs. "I&apos;m not a woodworking purest. I&apos;ll use whatever I can to get the job done," says Mulcahey. The traditional joinery Mulcahey uses and his skill in reading wood grain â€” combining woods in a way that reduces expansion and contraction with humid or dry conditions â€” serve the pieces both aesthetically and functionally. Reading grain directions, the way a lapidary might read a jewel before cutting it, can also add tension, drama or unity to the piece depending on how Mulcahey mixes and combines grain directions. Joinery, too, can add strength and visual variety. 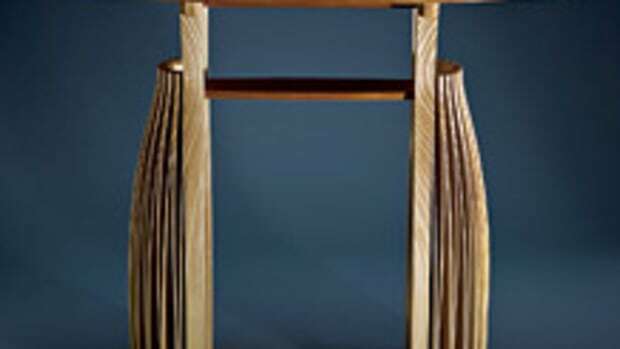 For now, Mulcahey uses the through tenon to add vertical strength to his chairs and as an additional design statement â€” the exposed tenon&apos;s end grain absorbs more stain or paint than the flat grain and shows up as a darker element in the chair â€” giving Mulcahey an additional design element. 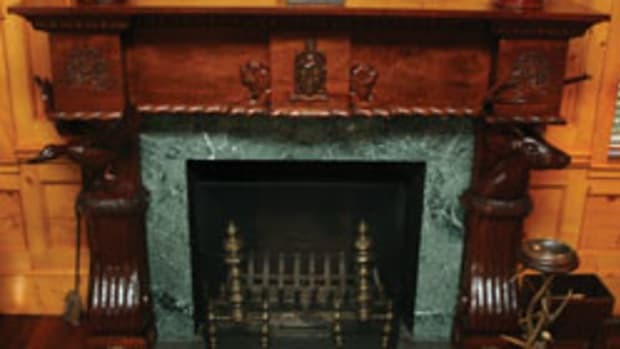 Mulcahey hopes to expand his joinery techniques. That will add strength and design to his work, especially a joinery technique that will span voids in his boards and pull together the variety of species he uses. So far, he&apos;s still experimenting. Mulcahey&apos;s seeking something like a butterfly joint, "but that&apos;s George&apos;s (Nakashima) territory, and I don&apos;t want to rip him off." In such details, Mulcahey&apos;s design integrity and skill show through. A look at his joints shows each piece fits perfectly into the other. No gaps. No torn edges. No wood fill. Only perfectly tight, perfectly joined wood, as if it were poured as liquid that then solidified. In Nakashima&apos;s spirit, Mulcahey sees design and technique as secondary to the wood itself. "Nature is the best designer," he says. "I just reconfigure it to make a piece. I&apos;m secondary to nature." It&apos;s that philosophy that has pushed Mulcahey into new territory. "Someone recently asked me if I&apos;m a craftsman or an artist," says Mulcahey. "I had to think about that for at least a week before I could come with an answer. I finally decided I&apos;m an artist. If you&apos;re making cabinets, even beautiful cabinets, you&apos;re making boxes. You repeat that beauty and perfection over and over. With these chairs, I&apos;m looking to make an individual statement."